When you are living with multiple compromised or missing teeth, it impacts the quality of your daily life. Chewing can become challenging and even painful, making it difficult for you to enjoy the healthy foods you were used to eating. You might also feel self-conscious about the appearance of your smile because it embarrasses you when you smile or meet new people. Partials and dentures in Stuart may be an ideal solution. Here’s what you should know. A full denture is an appliance that is designed to replace an entire arch of missing teeth. It is typically made of acrylic and custom designed with your facial structure and skin tone in mind, which allows for a natural and aesthetically pleasing appearance. 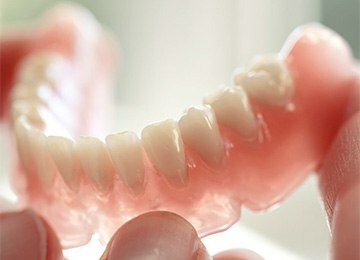 A traditional denture is removable, and it relies on suction and a secure fit to keep it in place. There is a learning curve for some patients as they get used to talking and eating with their new denture; however, most patients appreciate the way that a denture immediately restores their smile, and even changes the appearance of their face. Are you missing multiple teeth, but you still have a large number of healthy teeth and you’re not quite ready for a denture? A partial denture is an oral appliance designed to fill in the gaps. 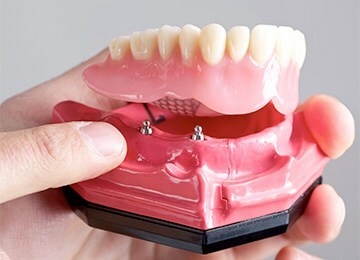 It fits using clasps to anchor to your healthy teeth, and it has custom prosthetic teeth strategically placed to complete your smile and restore function to your bite. A partial is an excellent option for restoring your smile while also protecting the integrity and health of your remaining teeth. Dental implants can also be utilized to support appliances like partials and dentures. Four strategically placed implants can secure a denture that is designed to “snap” into them. The implants provide a more stable support that prevents any movement or slippage when you talk or eat. They also offer the added benefit of protecting your jawbone from the deterioration that happens with traditional dentures that apply pressure to your bone. Would you like to learn more about your options for reclaiming your smile? The first place to start is to schedule a consultation with Dr. Crary or Dr. Bacha. They can assess your situation and determine which treatment option will best suit your needs. Your dentist in Stuart is happy to guide you through the process of restoring your smile and your oral health from start to finish, so give Aesthetic Dentistry of Stuart a call today.